*uhuk* so basically this is my haul from Korea.. Do not say that I am a spender, I will tell you that 95% of this haul is not for me. These are for my friends and family, they want it because they heard the cosmetics are cheap in Korea. Apieu Mineral Lip & Eye Make Up Remover for only 1,5USD ! Also the face shop herb day cleansing foam, on sale in korea to 3,5-4 USD! In case you dunno, I only buy 3 items for myself! Which are Apieu, cos it's cheap. Tony Moly Sunblock, cos I want it for so long, and also Watsons hair treatments, because I really need treatment for my hair! Half of them are for my family and my mom's friends, while I keep the jajangmyun, burger, natto, and cold noodle! klo snack di sana emang termasuk mahal sih kalo diconvert ke rupiah >_<"
yeap! 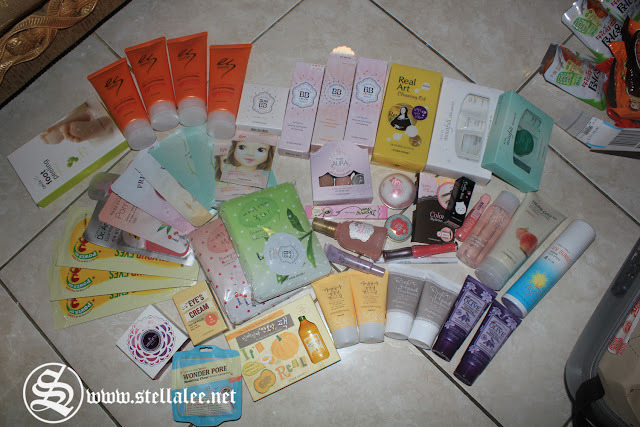 korean beauty stuffs' packaging is so cute :D irresistable!! isinya 10 pcs cuman 10.000 won :) dan lagi promo buy 1 get 1 juga hehe..
very cheap there!! but i think HK is cheaper?